Farming can significantly reduce your taxable income. 3. Can Home Improvement Costs Be Used as a Federal Tax Deduction? Operating a working farm can significantly reduce your federal income tax liability. Farmland, equipment and fuel are so expensive that the tax write-offs associated with these items are typically enough to wipe out farm earnings. Furthermore, as long as you are actively involved in the farming operation, the loss can reduce your other taxable income. While you cannot deduct the purchase price of farmland on your taxes, plenty of other tax deductions are associated with farmland. Interest paid on loans to purchase farmland is deductible. Interest paid on loans to do any improvements to the land is deductible. Examples of farmland improvements are clearing trees and brush, putting in access roads and tiling wet ground. Interest paid on equipment and supplies is also tax deductible. Property taxes paid on farmland are tax deductible. If you have a home on the farmland, use a percentage of the taxes paid. Allocate a portion based on the value of the home versus the value of the farmland. Contact your local tax authority for the current value of farmland per acre to calculate the percentage. Items purchased for use on the farm, such as feed, fertilizer, chemicals and fuel, are tax exempt. If you paid taxes on these items, you may deduct it on your income taxes. Keep receipts for gasoline purchased where road tax was paid as you can receive a refund of road tax paid on your federal return. Internal Revenue Service Publication 510 has details. Depreciate farm buildings over 20 years. Use your mortgage appraisal to separate the values of buildings from land or check with a local tax assessor. Improvements to farmland, such as wetland tile, can also be depreciated. 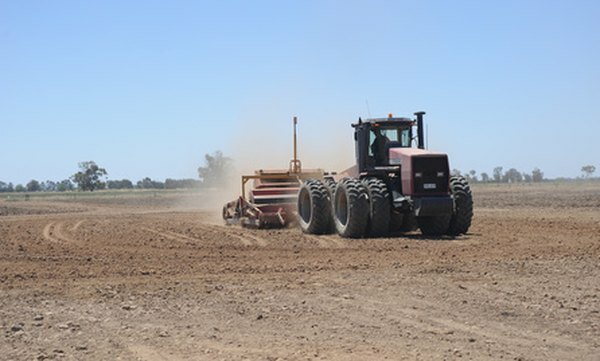 Equipment purchased for farm use can be depreciated over seven years. The IRS changes methods allowed; for example in 2010, a 100-percent deduction was allowed in the first year, so see instructions for Form 4562 each year. You can also use the depreciation method that best fits your needs for new equipment. For example, if your income was not sufficient to use the 100-percent method, you could have elected to use straight-line depreciation in 2010 instead. Other items, such as computers used for your farming business, can be depreciated over five years. In some cases, items can be written off 100 percent under Section 179. All supplies for the farm are deductible. Feed, fertilizer, chemicals and bedding are examples of farm supplies. In addition, office supplies you use for your farm are deductible. Ink cartridges, paper, business cards, phones and fax lines used for the farming operation are tax deductible. Keep all receipts and check with your tax adviser about changes to the current tax code. Keep records of all miles driven for farm purposes. If you are going to look at farm equipment, write down the date, beginning and ending mileage. If you are going to the mill to get fertilizer, write down the same details. If you go to the store to get an extension cord to use on the farm, write it down. All farm-related mileage can be deducted at the per mile rate set each year by the federal government.